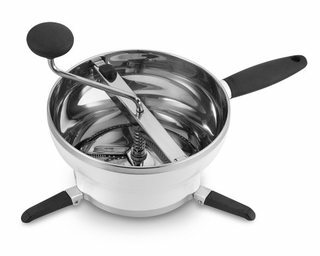 Here is a manufacturer’s image of the food mill we got. There may be better ones on the market, but I am pretty happy with my Good Grips. The garden continues to produce lots of nice tomatoes and peppers, although the other plants are starting to show serious signs of suffering. Still, with several pounds of tomatoes this week, I decided to make a batch of pasta sauce. I think that the last time I talked about processing tomatoes, I was using a sieve but I have since entered a whole new world. The world of the food mill. I cannot understand what has taken me so long to finally get myself a food mill. I will excuse myself by saying that I was simply ignorant of the incredible helpfulness of this simple mechanical device. It is basically a grater with a press attached, which you hand crank to process food over the grates. The grates pulverize soft foods (like the insides of tomatoes) but won’t allow skins or seeds to pass through. Brilliant! Fine Cooking has a nice little report on how to pick the right food mill for your needs, all I know, is that I have needed this for so long! Here is the jar of pickles. Fermentation needs to happen anaerobically, so you want to be sure to keep them under the brine (as we do with weights) and the fermentation produces gases which we use the one way air valve at top to let out of the jar without letting new air (and bad bacteria) in. We have not had a strong harvest of cucumbers this year (or the last couple of years). I made the mistake of planting our cucumber plants in the same bed that I did last year, and I think this is contributing to the issues we are seeing. Rotate your crops, ladies and gentlemen, rotate your crops. The cucumber plants are withering, showing yellowing and drop off of leaves, and the cucumbers themselves are not fully maturing or are even rotting on the vine as tiny babies. Self fermenting foods are actually very simple to make, it just takes a leap of faith that our hyper-pasteurized world has made very difficult to take. With the discovery of germs and the advent of the germ theory of disease in the mid-1800s, our culture began a long decent into fear of all things bacterial, but the truth is that we evolved alongside our bacterial brothers and they can help us as much as they have potential to do harm. It is clear that the understanding of germs has helped us to combat some of the worst of the bogey men, and I am truly glad I don’t have to worry about contracting the black plague, but we have thrown the baby out with the dirty bath water, and it has been argued that our total lack of raw fermented foods in our diet today may be contributing to the high level of non-bacterial diseases our culture currently suffers from. There is a growing trend around Austin of small batch production of raw pickles, sauerkraut, kombucha, and kimchi. You can even now buy vinegar with mother int he bottle (we grow our own) These classic fermented food had been staples for their traditional cultures, and I am glad to see them making a comeback. 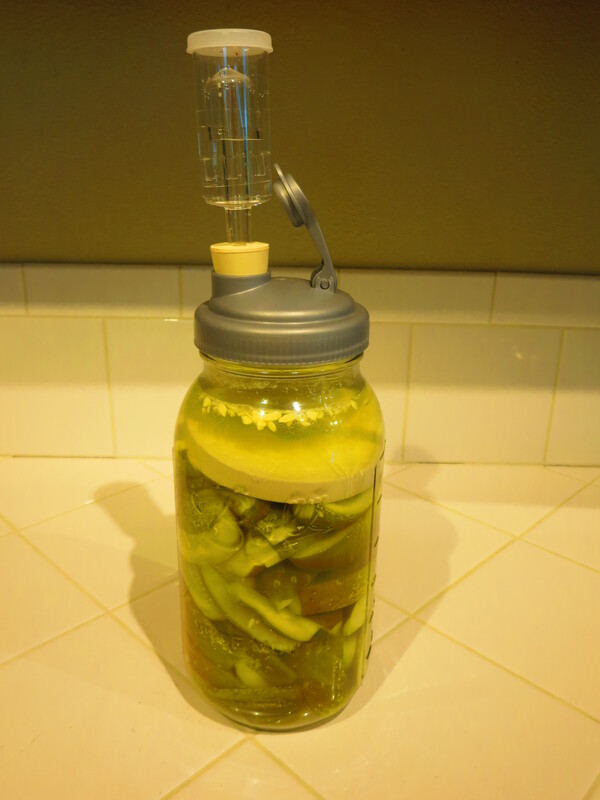 I look forward to opening up our own jar of pickles, grown and fermented right here at home!